Out-of-the-box, Reveal can tell you which companies are visiting your site - even if they've never filled out a form. This information can be vital when targeting a focused set of accounts or if marketing/sales wants to proactively engage when buying interest is at its highest. Below are some examples for adding this data directly into Google Analytics in < 5 minutes. For a straightforward, tabular view, add a new widget and select the Standard Table layout. 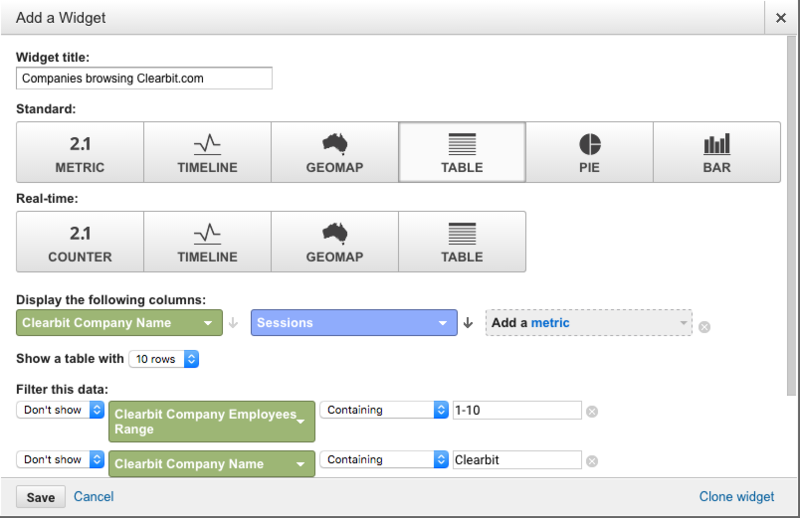 Select the Clearbit Company Name from the drop-down and choose the numerical metric you wish to display - Sessions or Users are good starting points. 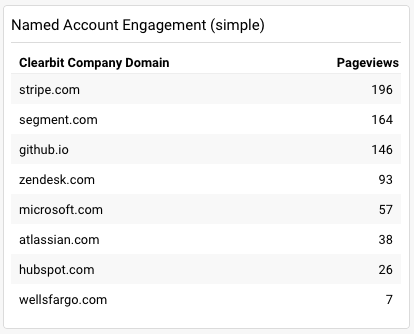 You can also filter in/out only the specific companies or business types you care most about - in the screenshot below, we've filtered out companies with less than 10 employees and any traffic from Clearbit offices. We highly recommend that you create Segments with your new Clearbit custom dimensions (think of Segments like a global filter) - in the example below, we've created a Segment that only shows us data for companies who use a certain set of technologies. Google Analytics will dynamically show you how large or small your segment is in the right-hand Summary pane. Once you've created your Segment, Apply the Segment and let your Dashboard dynamically adjust. And you're done!